Gavan & I went out on a real date on Friday night. We almost had forgotten what that was so we thought it was time! Nana & Papa came to keep Jaylen while we were gone & she had a blast, of course. We ate at Vito's, which is a small Italian place on May. The food was yummy and we got out of there just before the huge rush of 90 reservations flooded the place......they had 192 reservations for Saturday night too! Then we headed to QSM to see Slumdog Millionaire, which was a really good movie. About 45 minutes into it I leaned over & told Gav that I didn't like it but then it got better. The reason I was having a hard time with it is because the way those kids were living is SO real & it just really hit me that people really live in the slums in this world and it's awful. Really made me think how truly grateful I am for the life I have. But like I said, it was a great movie. On Saturday, Gavan gave me beautiful flowers when he came home from his b-ball game at church & then Jaylen attended her first birthday party! Chelsea turned 1 and we had a great time celebrating it with the Picker's! The girls were so cute playing together and at one point I was walking Jaylen across the room & Chelsea walked over, grabbed Jay's hand & walked with her.......it was so cute. They are going to be great friends! Then we made a trip to Target & headed down to see Clay, Vanessa & Cooper. After visiting them for a while, we all decided to grab Chick-fil-A for a romantic dinner! It was a great day that we got to spend all together. Those days don't happen very often anymore & I loved it! I'm so very thankful for Gavan. He is a wonderful Christian husband, father, leader & provider. My life is truly blessed because of him. He is my rock & my best friend & I would not change a thing! Love you Gavan! Hope you all enjoyed your Valentine's Day with your sweetie! 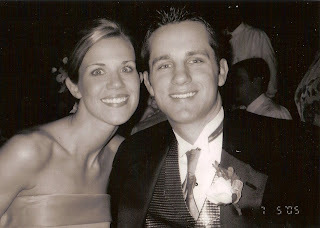 I didn't take any pics from this weekend but here is one of my fav pics of us from 2005.